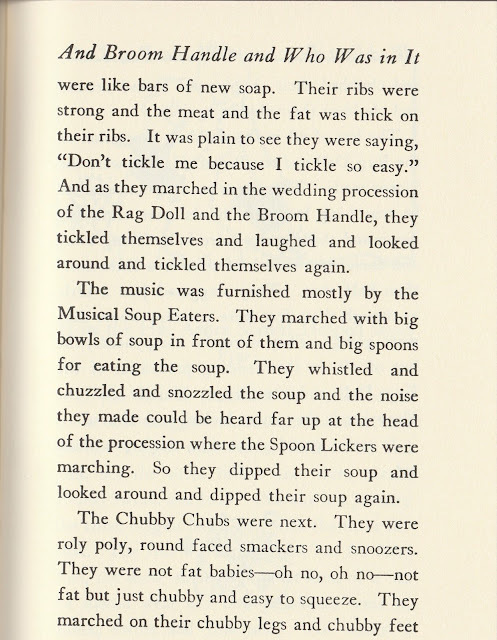 Because spring weather is by its nature indecisive, I wanted to bring my favorite story about the epitome of indecision, Carl Sandburg's "How Deep Red Roses Goes Back and Forth Between the Clock and the Looking Glass" from Rootabaga Pigeons. Instead I'm offering a story from Rootabaga Stories, copyrighted only one year earlier as 1922 and earlier wasn't affected by an extension of copyright law forcing us to wait until January 1, 2019 for it to enter Public Domain. It was a favorite when my daughters were picture book age and I'm sure helped one of them love words enough to become a writer. I'll say more later about why Carl Sandburg's Rootabaga Stories is Public Domain and how the book changed copyright law after today's story, "The Wedding Procession of the Rag Doll and the Broom Handle and Who Was in It." Then I'll tell how books entering Public Domain could become even worse. The picture book version, illustrated by Harriet Pincus is not Public Domain, but, like the many other websites showing it, I believe the cover advertising her wonderful work is considered acceptable use. Harcourt, Brace, and World (now HBJ as World became Jovanovich) published it in 1967. 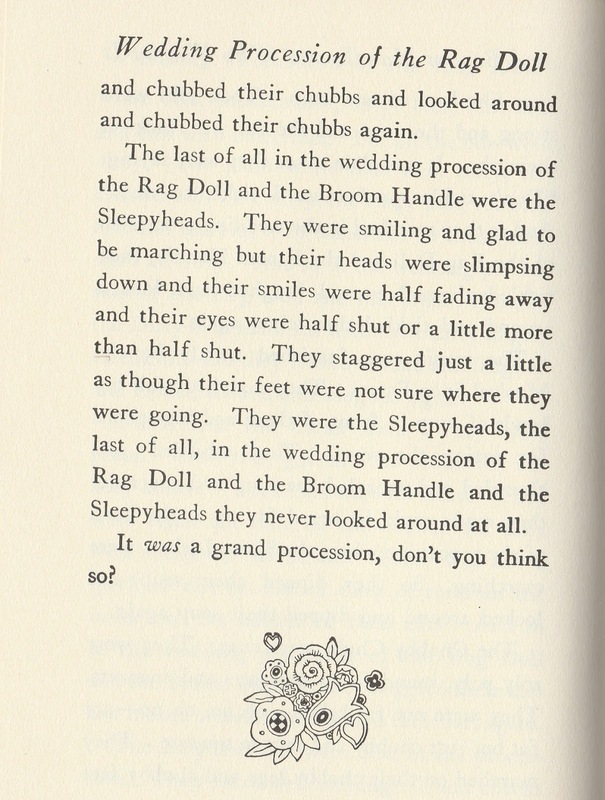 I'll also say a bit later about Ms. Pincus, as her artwork definitely adds to the fun of Sandburg's story. 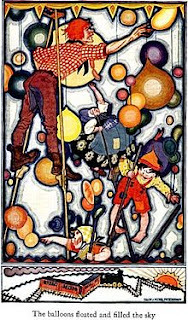 This version has the original illustrations by the Petershams. 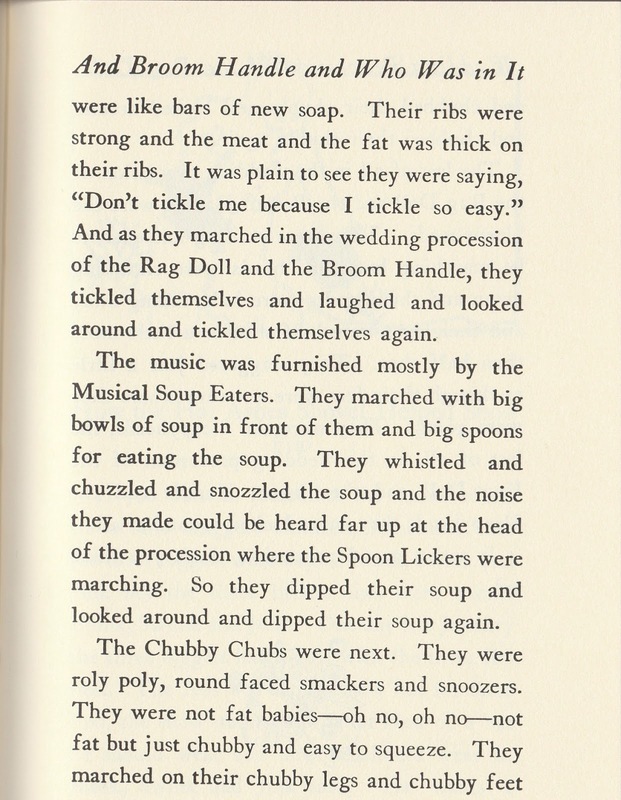 Since there are fewer of them it probably doesn't hurt to remind you this is a poet playing with nonsense sounds for his two daughters, Spink and Skabootch (Margaret and Janet). 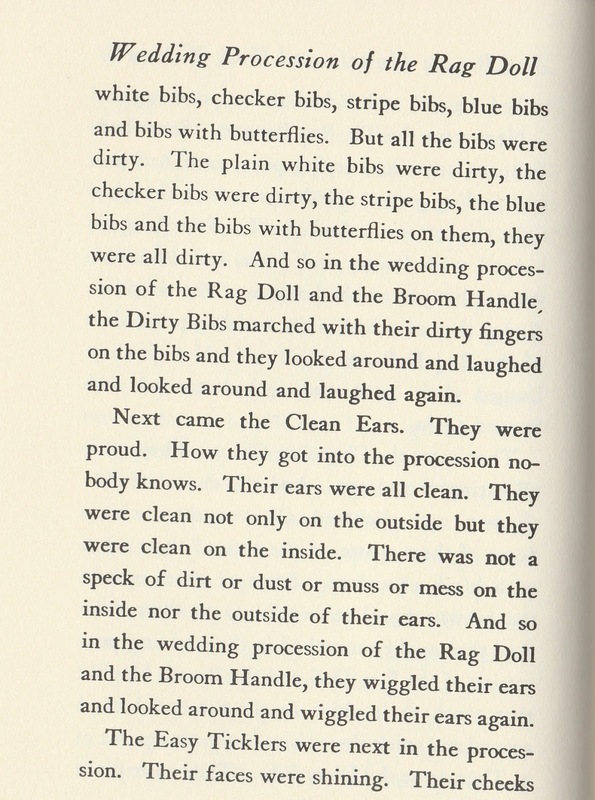 By the next book he dedicated it to Three Illinois Pigeons as Helga, a.k.a. Swipes, had joined them. The girls were each five years apart in age. Stories in both books are best enjoyed by reading them out loud! So who was your favorite? 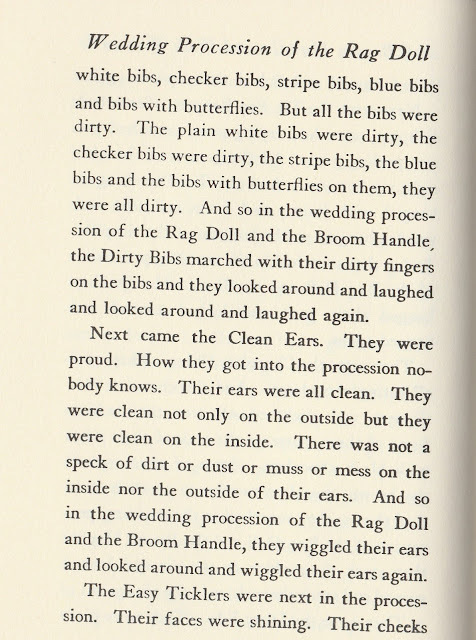 I love the way the Dirty Bibs " "looked around and laughed and looked around and laughed again." 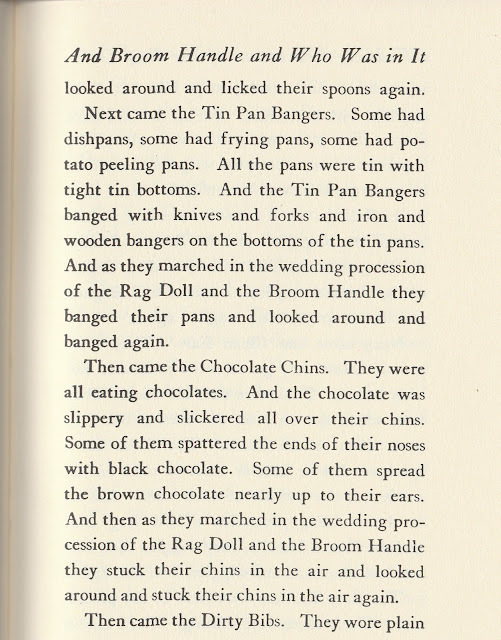 Still I probably would have been with the Chocolate Chins with the "chocolate...slippery and slickered all over their chins." I hope you were able to picture it all, but still I want to suggest looking up the picture book version of today's story. 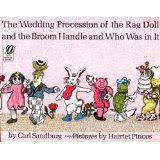 When I learned the artist, Harriet Pincus, was born in 1938 I knew the picture book illustrations were still in copyright, but then I learned more about her and want to mention it. Like many artists she started young, wanting to be an artist in fourth grade, when she officially became the class artist. However when she was sixteen polio completely paralyzed her, confining her to an iron lung for two years. Fortunately, when she was released from the hospital, her physical therapy helped her continue drawing and painting, even though she was in a wheelchair for the rest of her life. 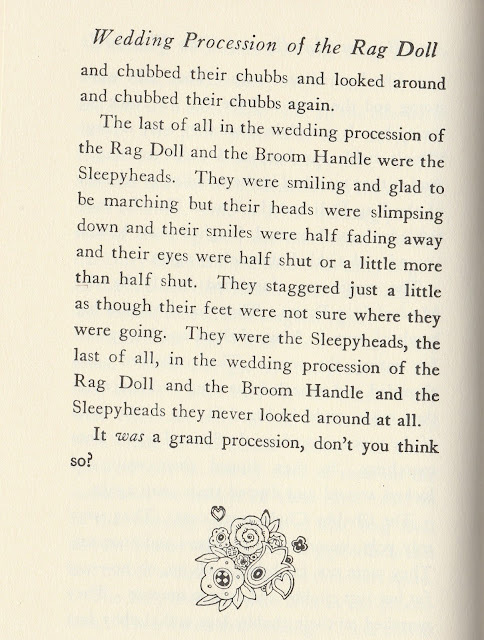 The Wedding Procession of the Rag Doll and Broom Handle and Who Was in It was her first illustrated book and she really captured the fun of the procession. She continued to illustrate other books, including writing and illustrating her own book, Minna and Pippin (1972). For more about her, if you can still find a library housing the many volumes of Something About the Author, check vol. 27, pp. 164-165, although it was written before her later death from complications from her polio in 2001. 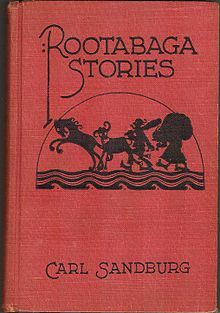 By all means look up Rootabaga Stories available from Project Gutenberg or Google. 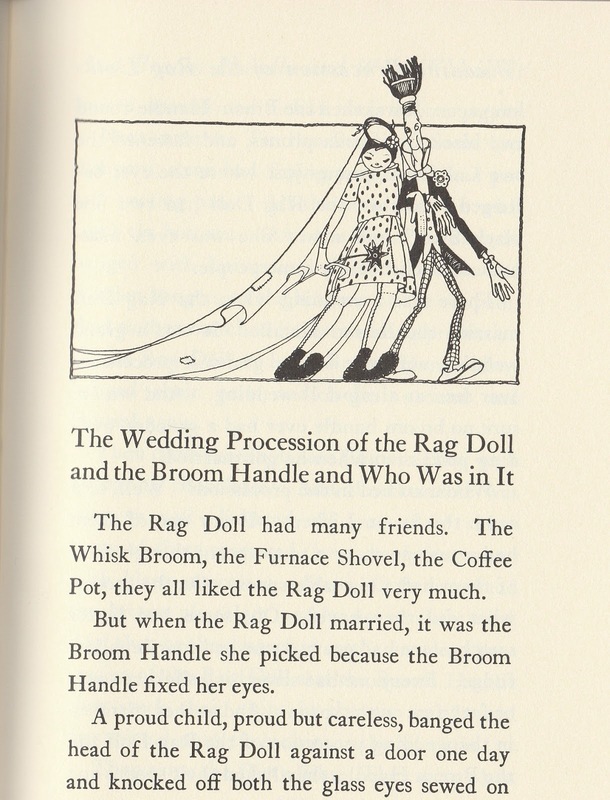 It even includes the original illustrations by Maud and Miska Petersham. There's a Wikipedia article about it telling you how the stories were written for the poet's daughters and why he created a MidWestern land for his American Fairytales instead of the usual world of European royalty. 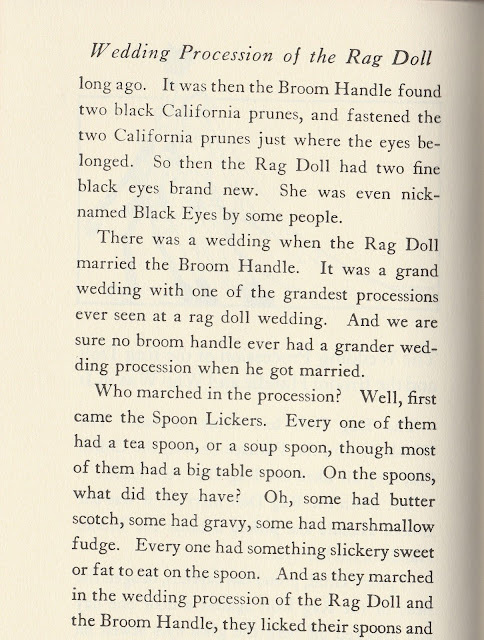 That article also let me know about a little known volume of Rootabaga stories called Potato Face published in 1930. Nowhere did I find online verification of a story I heard about copyright and Sandburg causing the extension to a total of 95 years if written from 1923-63 and renewed. I was told it was to care for his disabled daughter, who must have been Janet. She died in 2001 at age 84, which means the 95 year extension would have covered her until she turned 101. I've no objection to that coverage for an author and his immediate heirs. The biggest problem with that change in the copyright law was learning if those works were renewed. Unfortunately for future lovers of Public Domain, with the most recent copyright law, before Public Domain status can be confirmed, the author's date of death must be determined. Good luck with less well known authors! From 1978 on, the U.S. current copyright law adds 70 years from the author's death. Carl Sandburg died in 1967 when even renewal was automatic, so all his work comes under the maximum of the 95 years from publication. If he had been alive and had written Rootabaga Pigeons from 1978 on the copyright law would have added 70 years after his death. That wouldn't include 1967, but if that version of the law had been in effect, it would have pushed his Public Domain to 2033. Let's take an author dying in 1978, his works won't enter until 2048. 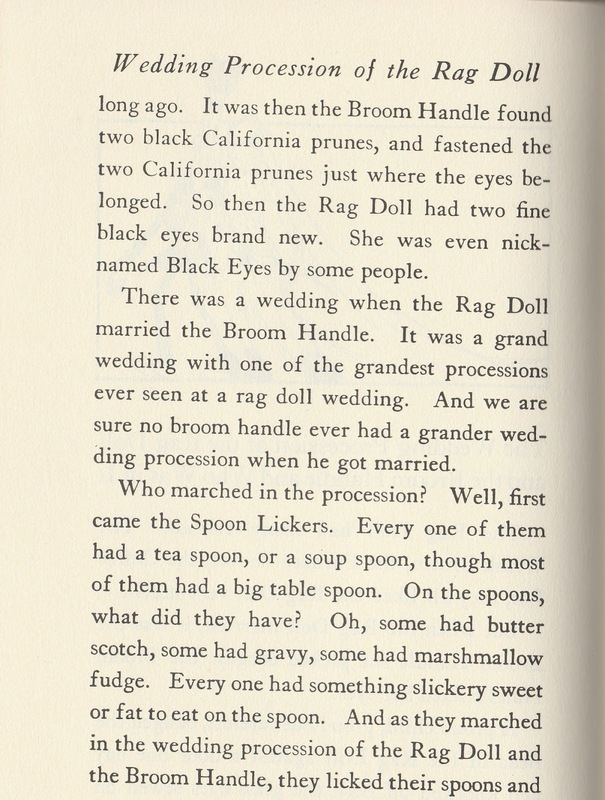 You can see why this is pushing Public Domain into nearly non-existence. In the meantime many people find the issue of Public Domain confusing, so I recommend Public Domain Sherpa as your guide when you try to climb the mountainous terrain of copyright and I especially suggest their useful calculator. As a perfect example of its value, I put in Rootabaga Pigeons fully expecting it to become available in 2018...WRONG! It becomes available January 1, 2019 after serving its final year of being locked up. So please keep your ears and eyes alert for this issue to return to Congress. Hollywood and the music publishers won't easily give up income from their classic productions.